To highlight Maple weekend (March 19-20th 2016) I made Maple Glazed Oatmeal Maple Cookies for our guests this evening. These delightful little cookies are my own adaptation of a recipe from a 1950's Betty Crocker's cookbook I'd gotten from my mother years ago. For the cookies, cream together the sugar, maple syrup and shortening/butter mixture first, then beat in each egg one at a time. Set aside. Next, mix together the flour, rolled oats, salt, and spices in a separate bowl. Slowly incorporate the dry ingredients with the wet, mixing as you go, when about half the dry ingredients have been put in with the wet, add the milk and baking soda, then mix in the rest of your dry. Spoon about 12 cookies onto a nonstick baking pan or baking sheet spray with your favorite cooking spray. Bake at 350 for 8-10 minutes until edges are slightly browned. For the glaze mix the maple syrup with the confectioners sugar until fully dissolved. Drizzle the glaze mixture over the cooled cookies. 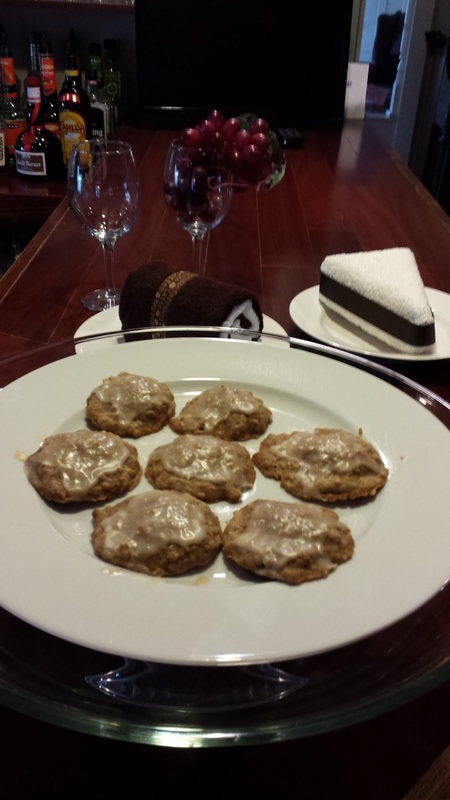 To taste these, or any of the assortment of cookies I make for our guests, come stay with us at the Rosewood Country Inn (http://www.rosewoodcountryinn.com). Our boy and I went next door and visited the neighbors' sugar shack again today. When we got there we found the entire family and their friends gathering to go up in the woods to collect the sap from the many trees they had tapped. Our boy got to do something I'd never done, he got to collect raw sap from a wild maple grove! We collected the sap from the buckets tapping the trees with the extended Messer family and their friends. The really cool thing is, the Messer's are the family that started our Inn back in the 1890's, when it was known first as the Pleasant View Farm and later the Pleasant View Inn. It's neat to see the link in the chain extended to our little family, and I really thank the Messer family for allowing us to join them in their traditions. That's part of what really makes Bradford a great place - people are so open and willing to let you join them and experience life, and our boy is getting to open his eyes to new experiences in what is truly a whole new world to him! The previous day he'd gone to visit one of his friends at the Hope Well farm (http://www.agrilicious.org/Hopewell-Farms), where they raise beef cattle, sheep, hogs and chickens along with having their own Maple grove. New Hampshire has opened it's arms to us and our little guy is soaking it all in. And in the process I walked 10 miles today! So New Hampshire has been good to open our boys eyes and to thin down my waist. After our family went to the town meeting in Bradford last night we came back to a beautiful starlit night. As I was walking the family puppy dog to close out the evening I even saw a meteor flash across the sky! This got me thinking about how wonderful the view was likely to be of major celestial events now that we've settled in out here in the countryside of New Hampshire. Even more, it got me thinking how we can we share this amazing view with our guests in the future. So I went out and found a short list of expected 2016 nighttime events (Credit given to the New Hampshire Astronomical Society ( http://www.nhastro.com/ and their wonderful calendar)). Geminids meteor shower – December 13-14 - This one is estimated at 120 meteors per hour – but Full Cold Moon could impact December 14th – so the best time to see them is Dec 13th. For those of you wanting to come experience any of the above give us a call or check out our availability online. Sniffles wouldn't mind the extra company once he's gotten to know you, if you want to walk with us. Or, you and your partner can talk a nice romantic stroll down the lane by yourselves to experience the same. Let me know and Sniffles and I can walk the other direction, so you can have your privacy that night! Either way you can take a nice walk for a bit down the country lane that runs in front of the Rosewood Country Inn, to see what the sky's decide to reveal that night! Disclaimer - of course, you never know when mother nature will allow us to see and you are never guaranteed to have as stunningly clear sky as I experienced last night. But if you aren't here to experience it, I can guaranteed you won't see it! It's March in New Hampshire and Odo and I (Stan) have been here for the last three months. So far it's been a blast, it's been a very mild winter, far milder than we had expected coming up from Texas but I can truly say we are loving New Hampshire. For those of you that don't know we moved to New Hampshire to take over the Rosewood Country Inn in December! Yes, all of our friends in the Lone Star state said we were crazy but it's what we've talked about doing ever since before we got married 11 years ago. Now onto March activities in the great state of New Hampshire. For those of you that don't know, March is the time for making maple syrup. So the sugar houses around here have already started cooking and the weekend of March 19th is officially Maple Weekend throughout the entire state. Attached is a link so you can find activities in our area or wherever you happen to be: http://www.nhmapleproducers.com/maple-producer-events/maple-weekend-and-month/. Different sugar houses will be open so you can sample their syrups and candies and all sorts of goodies! Come on down or up as the case may be and sample a few, and after all that sugar you will need to rest so come on by and stay in one of our 11 beautiful rooms. P.S. For anyone allergic to dogs or animals in general we can assure you our puppy dog never comes into the Inn. If you are outside he will come bark at you, or sniff at you but he's as sweet as can be and just curious.